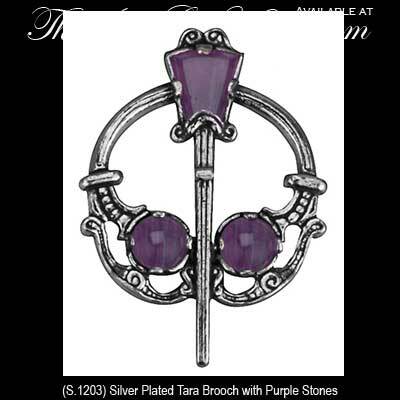 Celtic Tara brooch features an antiqued silver plated finish that is accented with purple stone. This Celtic brooch is enhanced with an antique silver plated finish and purple stones and measures 1 1/4” wide x 1 3/4” tall. The Tara brooch is made by Solvar Jewelry in Dublin, Ireland and is gift boxed, complements of The Irish Gift House.